Recently Matilda and Kendra of the Women’s Memoirs blog posted an essay I wrote last spring about the birth of my first child in response to a call for memories of April. The birth of a child is always a momentous occasion, which my step-cousin’s daughter reminded all of us last week. Her newborn is so beautiful, and he was so joyously anticipated. My first-born turned 21 years old last spring. It takes old photos to remember how little (and innocent!) 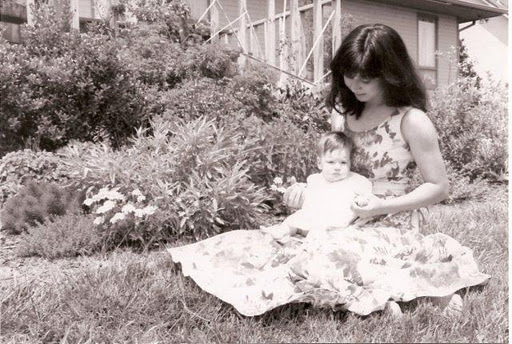 she once was, but somehow I was able to recall so much about her birth and how I felt about having a baby, and I poured that passion into “And a Child Was Born.” I hope you remember well the births of each of your children. Perhaps you’ll write about them or otherwise share them with your kids. I bet they would really like that. What a gorgeous photo! It belatedly occurs to me that photos are a sort of memoir, aren't they. Thanks, Debbie. I agree, photos are a sort of "flash" memoir.